Oliver has over 15 years of experience in supply chain finance and account receivable finance solutions. With the market experiencing increased interest in Supply Chain Finance, which encompasses solutions that help corporates buyers and their supplier to improve working, the industry is moving from an ongoing evolution to a revolution. 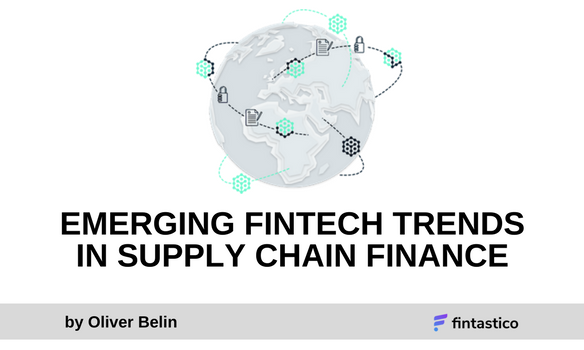 A key part of this revolution comes from emerging fintech players in Supply Chain Finance, a market with a potential of over $2 trillion in financeable highly secure payables. While commercial banks still dominate a large part of this market, it is unquestionable that fintech solution providers are disrupting the industry with many financial institutions collaborating in order to stay competitive. Initially, Supply Chain Finance solutions and dedicated technology platforms were introduced by the corporate buyers themselves such as the German retailer Metro Group and their in-house entity MIAG or the French retail giant, Carrefour with the subsidiary FINIFAC. However, the market and options have evolved since then with more and more large commercial banks rolling out their own Supply Chain Finance platforms. In the 21st century, fintech providers, initially just offering cloud based technology platforms without funding emerged and started to introduce dedicated services around Supply Chain Finacne including supplier onboarding, spend analysis, and electronic invoicing. Many fintech providers typically have relationship with a network of banks and alternative financiers allowing the customers to select the best funding solutions for their program. However, the number of financial institutions can vary considerably between fintech providers. The same is the case with number of programs and suppliers using the platform. Based of the growing interest in Supply Chain Finance with numerous facilities being implemented, companies face the challenge of having to use multiple, different platforms managed by banks and fintech providers. Today, it is not unusual for companies to be part of over a dozen of Supply Chain Finance programs, which one would think is good because of the risk and the concentration reduction. However, it requires a lot of time and efforts to join and manage these individual programs including onboarding, KYC checks, legal documentation, terms and conditions and differente technology platforms with various degree of automated integration capabilities. These disconnected, inefficient setups place hard limits on business models, lead to a poor client experience, and restrict the ways, companies improve their working capital through Supply Chain Finance programs. To solve these challenges and move to a new ecosystem, where banks and fintech providers are collaborating rather competing with the same underpinning technology behind the platforms since the 90s, some new model emerged in the market. These developments are focusing on automation, APIs and an open infrastructure, enabling more efficient Supply Chain Finance solutions through the creation fo trusted and permissioned interactions between financial institutions, corporate buyers, suppliers as well as, B2B networks and service providers. Instead of using multiple destination applications, each participant can use their own customized solution based on their individual needs and leverage the long-standing relationships with their banks while allowing the collaboration with other financial institutions. Traditionally, Supply Chain Finance was about funding and optimizing working capital. Today, the market evolved to new models focusing on collaboration, efficiency gains, better security and reduced costs in delivering such solutions. In the near future, we will see who will join this growing network of founders, credit insurers, B2B networks, technology and data providers and reap the benefits of this collaborative approach and who will be left behind with their destination application. CMO of TradeIX and worked for numerous leading organizations in trade finance and had key roles with PrimeRevenue, GSCF and Sumitomo Bank. In 2008, he founded Swiss Commercial Capital, a company specialized in trade finance solutions, which was successfully sold to Macquarie Bank in 2011. Oliver is the co-author of the book Supply Chain Finance Solutions and a frequent speaker on this topic.